Lev Zilbermintz showed me the score to this chess miniature played by him against Women's Grandmaster Martha Fierro in a game/30 simul that she gave on 8/6/2006 at the Internet Chess Club. 1.e4 e5 2.Nf3 d6 3.d4 f5 4.dxe5 fxe4 5.Ng5 d5 6.e6 Nh6 7.c4 Bb4+ 8.Nc3 d4 9.Qh5+ g6 10.Qxh6 dxc3 11.Qg7 c2+ 12.Ke2 Qd3#. There has been some lively back-and-forth on the Internet regarding my victory over Sam Sloan at Hackettstown in August 2005. The game happened at game/90 in the fourth and final round of a tournament with a strong field of players. In round one, I had the audacity to beat ACN editor Steve Ferrero who is also my USATE captain. Then came draws against a current and a former NJ state champion, Tommy Bartell and Steve Stoyko respectively. So now it was the money round, and I as White was paired against Sloan, better known for being a chess politico than a player although he seemed to be performing at a higher level than his USCF rating of 1931 might indicate. The reason why I am giving the reader this background information is to put in better perspective my decision to avoid playing the standard knight sacrifice against Damiano's Defense. I felt certain that Black would decline the piece sac as Chigorin recommended, leading to a position where Black is slightly inferior but material is even. This is not the kind of game that I wanted to play in the final round of a tournament, especially against an opponent with more practical experience in this variation than I have. Imagine my surprise when, after the game, Sam said he was prepared to accept the knight sac, relying on some new analysis! The reader can find this game by going to Yahoo Search and entering Damiano's Defense Declined, although I am unsure if Sam is correct in naming the opening as such. It seems to me that, if anything, Chigorin's line declining the piece sacrifice should bear that title. In any event, here are the moves to a mistake-filled game that ended unexpectedly with a problem-like move. 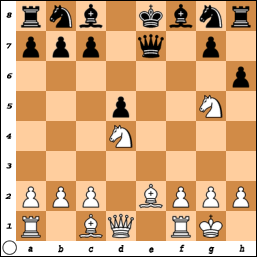 As stated above, I assumed that 3.Nxe5 would be answered by 3...Qe7 which led to a draw in Fischer-McGregor, Houston simul 1964 after 4.Nf3 d5 5.d3 dxe4 6.dxe4 Qxe4+ 7.Be2 Bf5 8.Nd4 Nc6 9.Nxf5 Qxf5 10.O-O Bd6 11.Bg4 Qb5 12.Nc3 Qc4 13.Be2 Qf7 14.Bb5 O-O-O 15.Qg4+ f5 16.Qh3 Nge7 17.Ne4 h6 18.Nxd6+ Rxd6 19.Bf4 Rd4 20.Be3 Rb4 21.Bxc6 Nxc6 22.b3 Re4 23.Rfd1 Rd8 24.Rxd8+ Nxd8 25.Rd1 Qe6 26.g3 Rxe3, drawn on account of 27.fxe3 Qxe3+ 28.Kf1 Qf3+ with perpetual check. I wonder what new analysis Sam intended to follow after 3.Nxe5 fxe5 4.Qh5+ which Fritz8 gives as winning by force after 4...Ke7 5.Qxe5+ Kf7 6.Bc4+ d5 7.Bxd5+ Kg6 8.h4 h5 9.Bxb7! For example, 9...Bd6 10.Qa5 Bxb7 11.Qf5+ Kh6 12.d4+ is curtains. Apparently Sam is unaware of this refutation because judging by his comments on the Internet he does not own Fritz8. 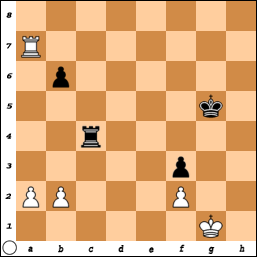 Black misses 16...b5 17.dxc6 Qxc6 winning the knight for insufficient compensation. Instead one of the contributors at Sam's website gives the following supposedly winning variation for White, courtesy of Fritz8: 35.Qa5 Nxh3+ 36.Kh2 Qc7+ 37.Qxc7 Rxc7 38.Rxb5 Nxf2 39.Rxd5, but 39...Nxg5+ 40.Kg3 Ne5 looks like a difficult ending to win for White. If Black wanted to draw, he should have played 35...Qxe3 36.fxe3 Bc6. After the game, Sam said I missed a win with 36.Rxb5 but 36...Qxb5! wins the exchange for Black. Believe it or not, this move loses. Black had to interpolate 37...Qc1+ 38.Bf1 and only now 38...Nf3+ 39.Qxf3 Bxf3 40.Rb8+ Kf7 41.Nxd4 when White's rook and knight and pawn can probably draw against Black's queen. 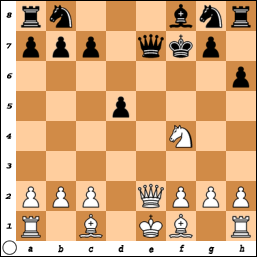 Now, after 39.Rb8+ Kf7, the move 40.Nxd4 is not a viable option with Black's queen guarding the d4 pawn. 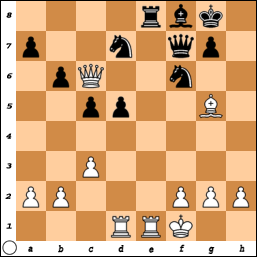 But White has a winning move, right out of a chess composition. Can you see it? 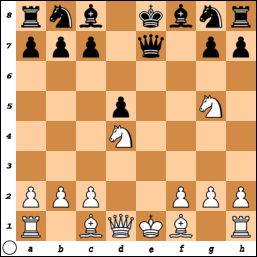 c) 39...Kf8 (or 39...Kh8) 40.Rb8+ forcing mate. A fantastic finish to a flawed game! Vladimir Nabokov has been credited with writing the best novel concerning the game of chess. Originally published in Russian using a penname under the title Zashchita Luzhina (or The Luzhin Defense), it is better known by the title of its English translation The Defense. Although it was first brought out in book form in 1930, The Defense had to wait until 1965 for an English-language edition, as the author himself relates to us in the foreword to this attractive novel. The protagonist of The Defense is one Aleksandr Ivanovich Luzhin, born in Russia around the turn of the century but who lives in Berlin from age fourteen until his untimely death some eighteen years later, largely in exile because of the October Revolution of 1917 which has taken place during his absence. Early in the novel, while Luzhin is still a schoolboy in Russia, there are forebodings of the disaster which is to overtake Luzhin later in life with the seeming inevitability of an announced checkmate. His father, a writer of boys' adventure stories, remarks: "Being born in this world is hardly to be borne." The young Luzhin is introduced to the chessboard when he encounters one in the attic of his house, after having fled from the rest of his family at a railway station. Luzhin's behavior as a schoolboy in his early teens can only be described as unsociable, preferring to sit alone on a woodpile each day in the schoolyard rather than participate in sports. His future genius as a chess prodigy, on the other hand, is intimated by his fascination with Jules Verne, Sherlock Holmes, and jigsaw puzzles. One day while hiding in his father's study he eavesdrops on a violinist - speaking on the telephone to some unknown party at the other end of the line - who describes chess as the game of the gods. This encourages young Luzhin to play hookey from school and visit his aunt's house, where the elderly woman teaches him the rules of chess. Soon Luzhin, who has never shown an aptitude for anything else, is defeating not only his aunt but his father, doctor, and geography teacher as well. Then, at age fourteen, having been recognized as a genuine prodigy, he quits school. Shortly thereafter, he becomes ill; and in order to help him recuperate Luzhin's father accompanies him to a resort on the Adriatic. As luck would have it, a chess tournament is about to begin, Luzhin enters it, and he finishes in third place. He never turns his back on chess again - not for the deaths of first his mother and then his father - until eighteen years later, now a grandmaster, he suffers a second illness: a nervous breakdown. It happens just after adjournment in a difficult position against Turati (whose name and playing style remind one of Reti) with whom he is tied for first place, late in a strong tournament in Berlin. By this point, Luzhin has engaged to be married. He spends some time in a sanatorium. Then, symbolically, he closes the lid on his chesspieces - and his chess career, as well - for what he deludes himself into thinking is marital bliss. The theme of exile re-emerges: first, exile from Russia; now, self-imposed exile from chess. Little by little, chess images begin creeping back into his life. At the movies with his wife one evening, he is disturbed by the sight of a chessboard with a fantastic position on it in the background of the screen. When he, by chance, meets an ex-classmate from school at a ball and the chum remarks upon Luzhin's chessplaying, Luzhin begins to replay the moves of his life from the time of the nervous breakdown onward. He begins to see a repetition of theme in the game of life, leading him inexorably to the chessboard and tragedy. He starts to construct a defense against this attack, just as earlier he spent days constructing a defense to Turati's favorite opening. When his former chess trainer, now movie director, Valentinov invites Luzhin to his movie studio named Veritas (or Truth) to have Luzhin play the role of a chess grandmaster along with Turati in an upcoming movie, Luzhin suddenly hits upon the correct defense to this irresistible attack by the forces of life. He must play an unexpected surprise move! So, sadly, the novel ends with what Nabokov referred to in his foreword as a sui-mate: Luzhin falling to his death from a window ledge where he has crawled. Hauntingly, as Luzhin plunges to destruction, there is a scene of great symbolism: the reflection from a nearby window has divided the chasm of darkness below into dark and pale squares. Perhaps the plot of The Defense is best summarized in this single sentence from the jacketflap: "The Defense is the tragic story of a man destroyed by his own genius and of the hopeless efforts of the wife who loves him to save him from himself." Although the novel ends on a tragic note, it is not all gloom and doom. There are beautiful lyrical passages describing the game of chess. Here, for example, is how Nabokov portrays Luzhin's state of mind during a game of blindfold chess: "He saw then neither the Knight's carved mane nor the glossy heads of the Pawns - but he felt quite clearly that this or that imaginary square was occupied by a definite, concentrated force, so that he envisioned the movement of a piece as a discharge, a shock, a stroke of lightning - and the whole chess field quivered with tension, and over this tension he was sovereign, here gathering in and there releasing electric power." In late September 2006, a documentary on the 1972 World Chess Championship called Fischer vs. Spassky that appeared originally in 1999 on the BBC was added to You Tube in four parts, with a combined running time of approximately 37 minutes. Besides Bobby Fischer and Boris Spassky themselves, some of the celebrities who were interviewed are grandmasters Larry Evans, Robert Byrne, and Nikolai Krogius; chess officials Viktor Baturinsky and Gudmundur Thorarinsson; authors Frank Brady and Alexander Cockburn; Soviet chess journalists Aleksandr Roshal and Viktor Babkin; and Fischer's attorney Paul Marshall. As well as seeing video highlights of the games that were taped on closed-circuit television, I learned that it was Lenin who coined the expression: "chess is gymnastics of the mind." It was surprising to hear Spassky say, "My years as champion were the unhappiest years of my life because I felt a huge responsibility." In Spassky's opinion, he lost the match when Fischer told referee Lothar Schmidt, "Shut up," in the ping-pong room before game three. Spassky then proceeded to play the game "like a rabbit caught in the gaze of a boa constrictor." The most amusing moment occurs when Paul Marshall and Robert Byrne tell the story of how grandmaster William Lombardy removed the distributor wiring from Fischer's car after game one to prevent Fischer from going to the airport. After the match, Fischer told an interviewer, "The Russians are the ones that started all this, and they are the ones who have been using chess as a propaganda weapon and using every, you know, trick to keep the title and all that...Probably they wish they never even started to play chess." Gudmundur Thorarinsson describes how the new world champion Fischer looked out his hotel window and said, "The only thing I can do is to play chess, but I do that rather well." In mid-October 2006 on Icelandic radio, Bobby Fischer gave a 43-minute interview during which he discussed the following topics that can be broken down into three categories: money, politics, and chess. Regarding money, Union Bank of Switzerland liquidated Fischer’s savings account of precious metals including gold coins and sent the proceeds to his bank in Iceland, but Fischer lost "several hundreds of thousands of dollars in Swiss francs" from the sale that was done without his permission. Fischer had deposited at UBS the $3.5 million that he won from his match with Spassky in 1992. But this pales by comparison with what Fischer calls "the biggest robbery in the history of the United States" perpetrated by the Bekins Moving and Storage Company in Pasadena which allegedly stole "hundreds of millions of dollars, even billions of dollars" of Fischer’s cash and papers that it took Fischer thirty years to accumulate. In regard to politics, Fischer describes his 2004 imprisonment in Ushiku Detention Center as being "kidnapped in Japan for nine months, dragged near a leaking nuclear power plant" where there was radioactive air, land, and water from a "massive nuclear accident in 1999" about sixty kilometers away. A few days before the interview, Fischer saw the movie The Road to Guantanamo and found similarities between the "outright torture" of prisoners at Guantanamo and the way in which he was treated by his prison guards in Japan. In Fischer’s opinion, the United States is an "imperialist" country that was founded by "extremists" who gave "blankets that were infected with smallpox" to the American Indians to kill them off. On the international front, Fischer thinks that the Chinese and the Russians are backstabbing the North Koreans, and apparently China is "really serious about bringing down the regime" in North Korea. Finally, regarding chess, Fischer reads from Vladimir Pozner’s 1990 book Parting with Illusions which mentions that Mark Taimanov was stripped of his title "grandmaster of the USSR" by the Soviet Chess Federation for losing his 1971 candidates match to Fischer by the "implausible score of 6-0." In the same book, a comparison is made between Fischer the chess player and Gorbachev the politician because both men made moves that were not understood until it was too late. Fischer considers Capablanca to be the greatest chess player of the 20th century in terms of "natural ability", but because there is so much memorization in chess "some kid of 14 today" could get a favorable position out of the opening against Capablanca. Fischer is "not a big fan" of Alekhine and much prefers the playing styles of Capablanca and Morphy. When Fischer played at the Manhattan Chess Club in the 1950’s, the "oldtimers" always spoke of Capablanca "with awe." Fischer is "having a really nice time" leading "a quiet, low-key life" in Iceland where everyone is friendly, but he plans to travel abroad eventually and is waiting until "the right moment." Bobby Fischer and ... Bobby Thomson? Besides being a chess master, I am also an avid baseball fan. During this offseason, I found time to read The Echoing Green, an excellent book by Joshua Prager that recounts the tale of Bobby Thomson's famous home run that won the 1951 pennant for the New York Giants against their archrival Brooklyn Dodgers. I was intrigued by the following sentence in the Author's Note: "Not all those I contacted were helpful, baseball fan Fidel Castro not caring to share if he recollected the game, Brooklynite Bobby Fischer willing to reminisce only for $200,000." I wonder how that interview might have gone. Perhaps Prager would have asked Fischer if he could hear the roar from the crowd at Ebbets Field when he was a kid growing up in Brooklyn. According to Prager, the Giants stole the opponents' signs from late July 1951 through the end of the season, aided by an electrician who ran a wire from the clubhouse in center field to the bullpen where a buzzer sounded to indicate what pitch was to be thrown. Supposedly one of the Giants coaches used a telescope in the clubhouse to spy the catcher's hand signals. If all this has a familiar ring, it sounds like Topalov's accusation that Kramnik aided by a cable in the ceiling of his bathroom received assistance from a computer in winning this year's world championship chess match in Elista. Hopefully we won't have to wait half-a-century to find out what really happened. One of the sharpest variations in the Philidor Counter Gambit occurs after the opening moves 1.e4 e5 2.Nf3 d6 3.d4 f5 4.Nc3 fxe4 5.Nxe4 d5 6.Neg5. In his book C.O.O.L. 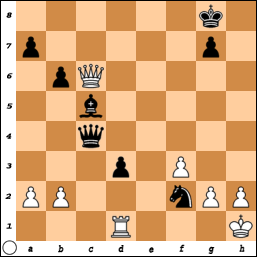 Chess, grandmaster Paul Motwani considers two possible moves for Black: 6...h6 and 6...e4. 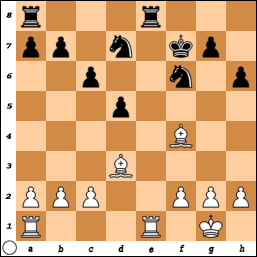 But recently I have played successfully a third continuation 6...exd4 7.Nxd4 Qe7+. Game One: Dragan Milovanovic (USCF 2230) - Jim West (USCF 2235), Hamilton Quad 12/17/2005 1.e4 e5 2.Nf3 d6 3.d4 f5 4.Nc3 fxe4 5.Nxe4 d5 6.Neg5 exd4 7.Nxd4 Qe7+ 8.Qe2 h6 9.Nge6 Bxe6 10.Nxe6 Kf7 11.Nf4!? A better try for White is 11.Nxf8 Qxe2+ 12.Bxe2 Kxf8 13.Bf4 c6 14.O-O Nf6 15.Bd3 Kf7 16.Rfe1 Nbd7 17.Bd6 Rhe8 with the absolute bishop pair, but Black has no pawn weaknesses. In fact, this position is virtually identical to the one arrived at by a different move order 1.e4 e5 2.Nf3 d6 3.d4 f5 4.Nc3 fxe4 5.Ng5 d5 6.dxe5 c6 7.Ncxe4 Qc7 8.Nd6+ Bxd6 9.exd6 Qxd6 10.Bd3 Nf6 11.Qe2+ Qe7 12.Qxe7+ Kxe7 13.O-O h6 14.Re1+ Kf8 15.Ne6+ Bxe6 16.Rxe6 Kf7 17.Re1 Nbd7 18.Bf4 Rhe8, Jerry McDonnell (USCF 2217) - Jim West (USCF 2287), Somerset Quad 2/4/1990. That game ended in a draw on move 52. 11...Qxe2+ 12.Bxe2 Nf6 13.c4 Bb4+ 14.Bd2 Bxd2+ 15.Kxd2 c6 16.cxd5 cxd5 17.Bf3 Nc6 18.Rhd1 Rhd8 19.Ke1 Ne7 20.Rac1 Rd7 21.h4 g5 22.hxg5 hxg5 23.Nd3 Ng6 24.Nc5 Re7+ 25.Kf1 Rd8 26.Rd4 Ne5 27.Rcd1 Nxf3 28.gxf3 Rh8 29.Kg2 Kg6 30.Nd3 b6 31.Nb4 Nh5 32.Nxd5 Re5 33.Kf1 Nf4 34.Nxf4+ gxf4 35.Re4 Rxe4 36.fxe4 f3 37.Ke1 Kg5 38.Rd7 Re8 39.Rxa7 Rxe4+ 40.Kf1 Rc4 41.Kg1 Rg4+ 42.Kf1 Rd4 43.Kg1 Rg4+ 44.Kf1 Rc4 45.Kg1, draw. This looks too ambitious. I had expected 9.Ngf3 c6 10.O-O Qf6 11.Re1 Bd6 12.Bd3+ Ne7 13.Bd2 O-O 14.Bc3 Qf7 with chances for both sides. 9...hxg5 10.Bh5+ On 10.Re1 Kd8 11.Bh5 Qxe1+ 12.Qxe1 Rxh5 13.Ne6+ Bxe6 14.Qxe6 Nf6 15.Qf7 Nbd7, Black has more than enough for the queen, or 15.g4 Rh8 16.Bxg5 Nbd7 17.Re1 Bc5 18.Qf7 Kc8 19.Bxf6 Nxf6 20.Qxg7 Rf8 21.Kg2 b6 22.f3 Kb7 with a complicated position. I could have transposed into this line with 10...Kd8 but tried something different. 10...Rxh5!? 11.Qxh5+ Qf7 12.Re1+ Be7 13.Qxg5 Kf8 14.Qe3 Bd7 15.Qb3 b6 16.Nb5 Bxb5 17.Qxb5 c6 18.Qa4 Nf6 19.Be3 c5 20.c3 Nbd7 21.Qc6 Re8 22.Rad1 Kg8 23.Bg5 Bf8 24.Kf1? I had anticipated 24.Rxe8 Qxe8 25.Bxf6 Nxf6 26.Qxe8 Nxe8 27.Rxd5 Nd6 with a roughly equal position. 24...Ne5 25.Qa4 Ne4 26.Be3 Ng4 27.f3 Nxe3+ 28.Rxe3 Ng3+ 29.Kf2 Rxe3 30.Kxe3 d4+ 31.cxd4 cxd4+ 32.Kf2 Ne4+ 33.Kf1 Bc5 34.Qc6?? My opponent had been behind on time all game long. It finally takes its toll. 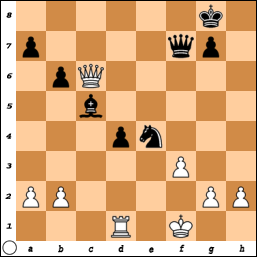 34...Qc4+ 35.Kg1 d3+ 36.Kh1 Nf2+, White resigns.